The long-awaited foray into the Vietnamese Rock, Pop and Soul sound of the late 1960s and early 1970s is finally here. 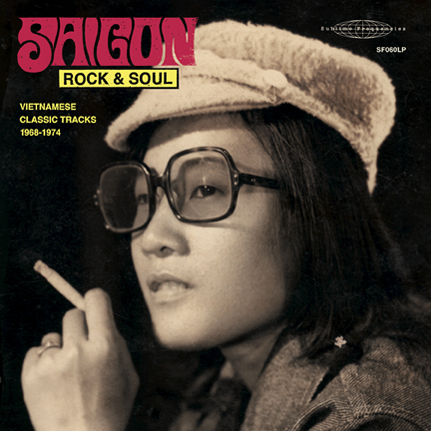 Saigon Rock and Soul delivers the goods International retro collectors have been searching for in vain for many years - and it delivers beyond belief. Every song is a mini-masterpiece be it heavy acid rock psychedelia, horn and guitar drenched funk grooves, or gripping soul ballads reflective of life during wartime. The tracks that form this collection cut a window into a rich musical Vietnamese music scene that has long been obscured, and for the most part, forgotten. As the scope of electrified Vietnamese music from the 1960s and 1970s begins to be revealed, it becomes evident that this was among the heaviest and most eclectic musical scenes of South East Asia at the time. These songs tell of war, love and what war does to love. All of them were recorded in makeshift studios and even US army facilities while the Vietnam War raged – and were issued by a handful of Saigon record companies on vinyl 45s and reel or cassette tapes. Westernized forms of music in Vietnam had appeared during the latter nineteenth century, and especially during the early 20th century, under the influence of the French colonizers. Tan Nhac (modern music) always incorporated both domestic and international sounds, and continued to develop alongside Western musical trends. During the 1960s and 1970s, pulp ballads were being recorded by leading crooners of the time who alternated between modern and traditional forms of regional music. When the electric guitar hit the streets of Saigon, Vietnamese renditions of contemporary instrumental trends such as surf rock, beat and twist soon emerged, followed by some pretty deep soul sounds inspired by Motown radio hits as well as funk grooves brought on by James Brown and his contemporaries. By the mid-1960s, Vietnam had been ravaged by war for years. American G.I.s had become a standard fixture in Saigon, as did many of the cultural artifacts they brought with them. This certainly included the music. The sounds of rock and roll dominated the radio waves, and Saigon nightclubs were teeming with new sounds. Musically, the Shadows and the Ventures soon gave way to the Beatles and the Rolling Stones as an enthusiastic set of young Vietnamese rockers signed on to the lifestyle, always eager to hear the latest musical trends the G.I.s would bring in on LP or tape. This era saw the birth of a vibrant rock scene yet rock music and anything that came close was commonly referred to as ‘soul’ in the Vietnamese genre-listings. Like many cultures in Asia, Vietnamese music is recorded, marketed, listened to and disposed of in a relatively quick manner. This level of advanced ephemera ensures a degree of difficulty when trying to unearth and discover cultural histories. Literally, most of the music heard here has been brought back from the dead. Artists featured include some of Vietnam’s most popular at the time: Elvis Phuong, Hung Cuong, Mai Lei Huyen, Le Thu, Thai Thanh, Giao Linh, Mai Lei Huyen and the CBC Band. Limited edition 2-LP vinyl release features 70 minutes of classic original recordings compiled by Mark Gergis housed in a beautiful full-color gatefold jacket with extensive liner notes.